Do you want to get started in astrophotography and are you searching for a color camera simple to use, compact, cheap but with high quality to photograph the planets and the Moon? The QHY5L-II color is the perfect camera for you. The sensor has a very good 1280 x 960 pixels resolution, allowing you to record, with the EZPlanetary included software, excellent high-resolution images. 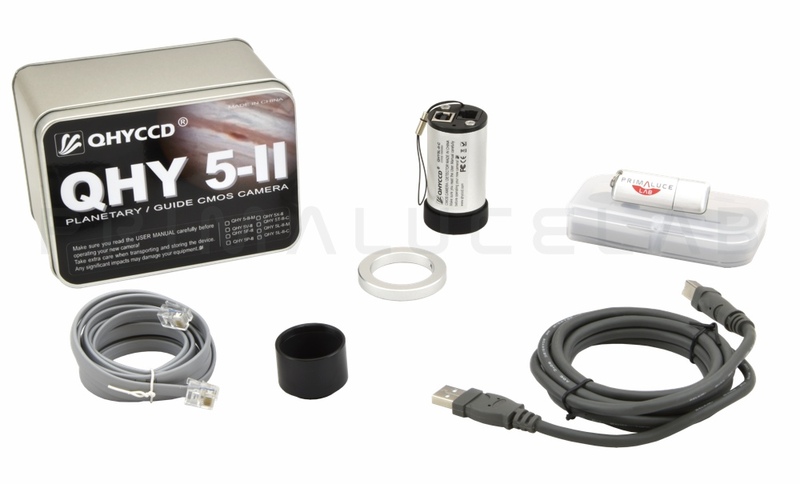 Although less sensitive than the same camera with monochrome sensor, the QHY5L-II color can also be used as a autoguider thanks to the integrated ST4 port and to the autoguide cable already provided in the package. When you want to imaging objects in the Universe, usually you start with the planets and the Moon since you can use short esposition times and therefore you don't need very large, stable and expensive mounts or other photographic accessories such as guiding systems. Lunar and planetary photography is much easier for beginners and it requires a specially designed camera, preferably color (since you can get great color details of the planets). The QHY5L-II color has all the features needed for this application: sensor with 1280 x 960 resolution and low noise, small pixel size (in order to obtain images with high resolution), possibility to record videos with high number of fps (images per second - up to 30 fps at full resolution and 106 fps at a resolution of 640 x 480) and a capture software specially designed for astrophotography. In this way you can capture brilliant videos and images of the planets and the Moon. Technical comment by Filippo: "For beginners in astrophotography, the QHY5L-II color camera is an ideal choice. In a compactand lightweight body there's all you need to shot great images of planets and the Moon. It's easy to use and the presence of a ST4 integrated autoguide port allows to use it as an autoguider. The maximum for such a low price." 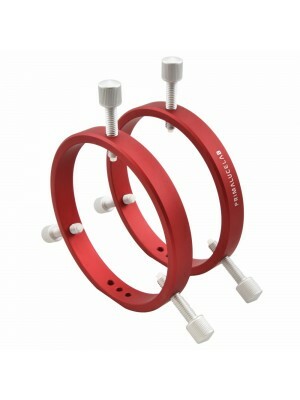 The QHY5L-II color camera can be inserted directly into the 31.8mm eyepiece holder of any telescope. If you want to use it as an autoguider, you can insert it even in the focuser of compact guide refractors. The USB cable is plugged into the rear port of the camera and the other end is inserted into the control computer. In the image on the left shows how to connect it to the Eagle control unit. 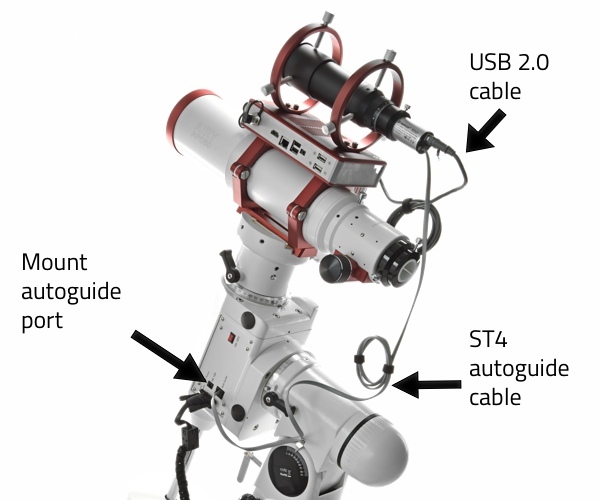 This, being directly installed on the telescope , and then on the mount, has among various advantages the ability to prevent the cables accidentally disconnect since they move with the mount itself. The ST4 cable is plugged into the rear guider port on the camera and into the ST4 guide port of the mount on which you use the camera ( n the image a N-EQ6 SynScan). In this way, the camera sends the correction signal directly to the mount and it will not need other external interfaces to set up your system. The QHY5L-II color is perfect for astrophotography beginners that wants an easy to use cheap but high performance camera. 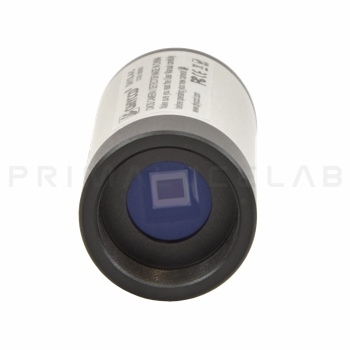 Thanks to 1280 x 960 pixels resolution sensor and small squares pixel with 3.75 microns side, you can obtain images with high magnification and resolution even with not high focal length telescopes. In order to increase the magnification, you can insert in the focuser, before the camera, a Barlow lens (preferably apochromatically). 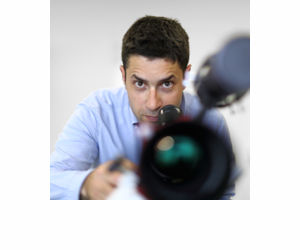 The high number of images per second (up to 30 fps at full resolution) lets you record videos with many images that, processed with softwares like Registax, bring to better quality final images. Connect the QHY5L-II to the PC via the USB cable included in the box and turn on the control software included with the camera, you can see the objects in real time on the screen and record images and videos! Although we recommend the monochrome version since it's more sensitive (so that you can find easily guide stars), the QHY5L-II thanks to the excellent sensor and the integrated ST4 guider port can be used as rautoguider. Thanks to a compact and lightweight (only 52 grams) body that can be inserted directly into the 31.8mm eyepiece 3holder of any telescope, to the integrated ST4 guide port (in the rear part of this camera, next to the USB 2.0 port) and the ST4 guide cable included in the package, you can connect the camera directly to the ST4 guide port present in most of the mounts.